Here is a list of classic car related events mostly in southern Alberta for 2017. I will be adding as the year goes on. February 11th 2017: Lethbridge Swap Meet in Lethbridge, Alberta. Exhibition Park. February 24-26th 2017: World of Wheels in Calgary, Alberta. BMO Centre. April 23rd 2017: Spring Thaw in Calgary, Alberta. Sunridge Mall. 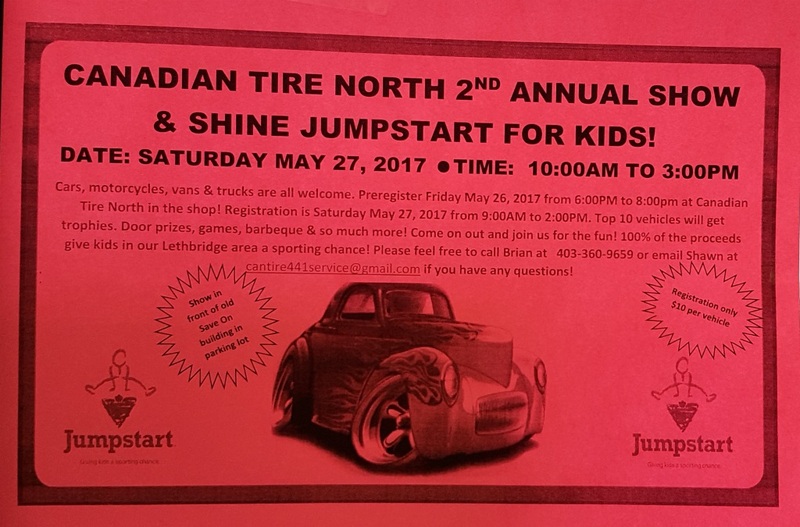 May 27th 2017: Canadian Tire North 2nd Annual Car Show in Lethbridge, Alberta. 1240 2nd Avenue A North. 9am to 2pm. May 26-27th 2017: Okotoks Collection Car Auction in Okotoks, Alberta. Okotoks Recreation Centre. May 27th 2017: Harleys & Hot Rods Show & Shine in Medicine Hat, Alberta. May 28th 2017: Coaldale Custom Cruisers S&S in Coaldale, Alberta. June 3rd 2017: The Bent 8 Boogie Show & Shine in Lethbridge, AB. June 10th 2017: Beiseker Car Show in Beiseker, AB. Main street. 8am to 3pm. June 17th 2017: Alberta Fairgrounds “T” Racers – High River Fairgrounds. 9am to 4pm. June 17th – 18th 2017: Wings and Wheels in Calgary, AB. 10am-3pm. Ticket purchase required. June 18th 2017: Kirks Tire Craft Show and Shine and Pre Tech – Le Barons Car Club. 10am to 3pm. 238 – 22 St N, Lethbridge, Alberta T1H 3R7. 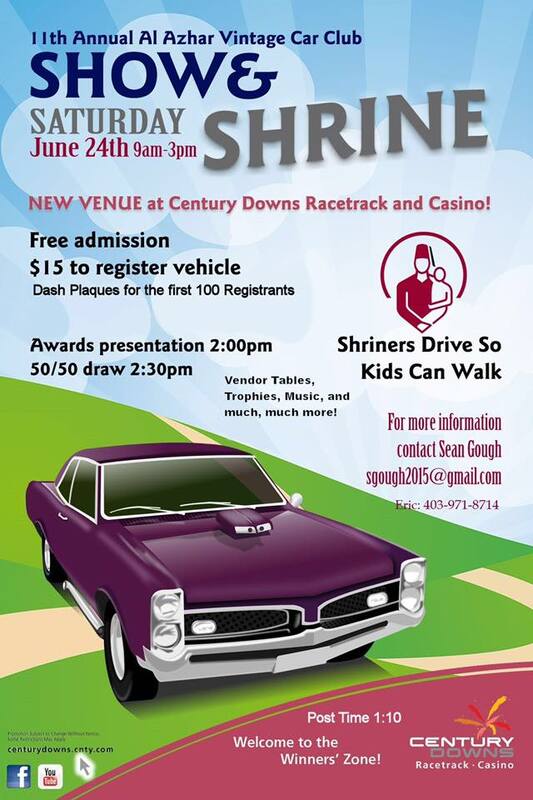 June 24th 2017: Al Azhar Shriners Vintage Car Club is hosting their 11th Annual Vintage Car Show – Century Downs Racetrack and Casino – 260 Century Downs Drive, Rocky View County. 9:00am to 3:00pm. Car Registration – $15.00 – dash plaques for the first 100 registrants. Great prizes, giveaways, trophies, vendor tables, music and much, much more! Award presentations 2:00 p.m. – 50/50 draw 2:30 p.m.
For event information please call Eric: 403-971-8714. June 24th 2017: Carseland Lions Show & Shine in Carseland, Alberta. July 1st 2017: Canada Day Show & Shine. Granum, Alberta. July 2nd 2017: Coyote Flats Pioneer Village Show & Shine in Picture Butte, Alberta. July 7th 2017: Friday night cruise in Lethbridge, Alberta. 3rd Avenue South – 7pm to 10pm. July 8th 2017: 100 ft Dash in Lethbridge, Alberta. Rocky Mountain Turf Club Grandstand. Begins at 11am. July 9th 2017: Show & Shine in Lethbridge, Alberta. Galt Gardens. 9:00am to 3:00pm. July 9th 2017: Auto-x in Lethbridge, Alberta. Exhibition South Lot. Begins at 8:00am. July 1th 2017: First Alliance 7th Annual Show and Shine. 10am to 3pm. 12345 – 40th Street SE. July 15th 2017: Beef and Barley Days Car Show in Carstairs, Alberta. July 15th-16th 2017: Vulcan Show and Shine plus Demolition Derby in Vulcan, Alberta. July 22nd 2017: European Classic Car Meet in Calgary, Alberta. 4011 1A St SW, Calgary, Alberta. July 22nd 2017: Show and Shine in Nantion, Alberta. August 4th-6th 2017: Heritage Acres Annual Show near Pincher Creek, Alberta. August 5th 2017: 13th Annual Crowsnest Pass Show & Shine in Frank, Alberta. August 11th-13th 2017: Pioneer Acres Annual Show in Irricana, Alberta. August 12th 2017: Coalhurst Show and Shine in Coalhurst, Alberta. August 13th 2017: Okotoks Show and Shine in Okotoks, Alberta. August 13th 2017: Porcupine Hills Classic Cruiser’s Car Show. 10 am to 8 pm. August 18th – 19th 2017: Cypress Rod & Custom 31st Annual Car Show in Medicine Hat, Alberta. August 24th 2017: A&W Cruise to End MS. Every A&W location. August 26th and 27th 2017: The Great Beater Challenge – Leaving From Lethbridge, Alberta. August 26th 2017: Taber Corn County Cruisers Show and Shine in Taber, Alberta. September 10th 2017: CVMG Millarville Motorcycle Swap Meet. 10am to 3pm. Millarville Race Track. September 15th – 16th 2017: 2nd Annual HORSEPOWER at Spruce Meadows. Classic car show and auction. September 23rd 2017: High River Show and Shine in High River, Alberta. October 7th 2017: Red Deer Swap Meet in Red Deer, Alberta. This entry was posted in Shows and Events. Bookmark the permalink. The Al Azhar Shriners Vintage Car Club is a non-profit organization that will be holding their 11th annual vintage car show on June 24th, 2017.